Eyes that look tired or aged may not truly reflect who you are or the way that you actually feel. Blepharoplasty revises features of the eyelids and surrounding area to give you a more rested and youthful appearance. The surgery, which Dr. Vu can perform on the upper eyelids, lower eyelids, or both, can also address excess skin that is affecting your vision. Years of experience in microsurgery procedures to enhance his blepharoplasty results. An expert’s understanding of what blepharoplasty can and cannot accomplish. Meticulous surgical technique that minimizes bruising and swelling and promotes subtle, attractive outcomes. Learn more about his work and what you can expect in his care. Redundant skin. Drooping eyelids can age your appearance, make you look tired, and, in more extreme cases, hood your eyes in a way that can affect your peripheral vision. Fine and coarse wrinkles. Revising unwanted skin in the eyelids has the added benefit of smoothing out signs of aging such as fine lines and wrinkles. Excess fat. People often associate puffiness in the upper and lower eyelids or bags beneath the eyes with fatigue. 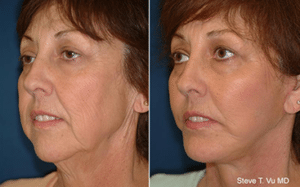 Blepharoplasty helps Huntington Beach patients get rid of the fat that causes this effect. Surgery can also reposition that fat to areas that have lost their youthful fullness, such as deep tear troughs. During your initial consultation, Dr. Vu will advise you about the limitations of blepharoplasty so that you can make the best choices for your care. For example, blepharoplasty is not a surgery that will change the shape of the eye or the orientation of your eyelids. In addition, surgery will not lift the eyebrows. If you have ptotic (droopy) eyebrows, Dr. Vu may recommend that you have a brow lift to raise their position. He frequently combines this procedure with blepharoplasty. Eyelid surgery can be an ideal option for Huntington Beach patients who want to look more alert and youthful. Dr. Vu will spend part of your initial consultation discussing the procedure in detail so that you can understand how treatment works. He will also review alternatives to blepharoplasty so that you can decide for yourself the right approach to achieving your goals. These may include the following options. BOTOX® is an injectable, non-invasive treatment that can reduce the appearance of crow’s feet at the corner of your eyes. However, BOTOX will not address excess skin and fat, areas of void, and the other aesthetic issues that can affect the eye area. Similarly, dermal fillers can fill in wrinkles and deep tear troughs. As injectable solutions, they do not require surgery, but they run the risk of accentuating lower eyelid bags as well as causing bruising or discoloration in the sensitive skin around the eyes. The other limitation of both dermal fillers and BOTOX is that the benefits they offer are only temporary. Other alternatives to blepharoplasty are laser treatments and chemical peels. These techniques can smooth away some of the fine lines in the lower eyelids, and the results should last longer than those of injectable solutions. The improvement will be limited to a few millimeters of tightening, however. Some Huntington Beach patients will be good candidates for one of these alternative approaches, either because their needs are less severe or because they are focused on a specific, treatable feature. If you are ready for blepharoplasty, you can expect the surgery to rejuvenate your eyes in a natural-looking and attractive way. Schedule a visit with the practice for an initial consultation with Dr. Vu. During your appointment, he will spend extensive time with you identifying the areas that you want to target for treatment. If you are a candidate for blepharoplasty, and if excess skin from your upper eyelids is affecting your sight, Dr. Vu may also recommend that you have an ophthalmologist test your vision. Huntington Beach patients may be able to have the procedure covered by health insurance in these cases. Dr. Vu will discuss the surgery in detail with you and answer any questions you may have. His office will prepare a quote for the procedure as well as options for financing. Transparency in your care is extremely important to our practice. When you are ready to move forward, you will schedule your blepharoplasty surgery and return to our practice in Huntington Beach for a pre-op appointment. Dr. Vu will go over what to expect on the day of your procedure, perform further examinations, order up lab work and prescriptions, and help you complete the remaining administrative steps. Your surgery will take place in Dr. Vu’s AAAASF-certified facility. This designation demonstrates that his practice meets the highest safety standards in outpatient care. The steps of your procedure will vary depending on your needs, but Dr. Vu will place any incisions that he makes in areas that should not be visible, giving the results a more natural appearance. If you will be having surgery on just your upper eyelids, you may only require a local anesthetic. Vu will remove excess skin, correct asymmetry in the eyelids, get rid of unwanted fat from the inside corners, and debulk the eyebrow area. Vu usually will conduct the procedure with conscious IV sedation. This will allow you to be comfortable throughout the surgery. In certain cases, Dr. Vu will also laser the lower eyelid skin to get rid of fine lines. He will remove excess skin, smooth out the eyelid area, and reposition the orbital fat. Dr. Vu believes there is great benefit to move the fat from the area of excess (bags) to an adjacent area of void (tear trough) since it solves two problems simultaneously. Also, it avoids the hollowed look and avoids the need for filler injections to the tear trough in the future. Huntington Beach blepharoplasty patients can expect to go home without having to wear a dressing on their eyes. After surgery, Dr. Vu recommends that you ice the area intermittently for the first 48 hours and wait to wash your face for 24 hours. Most patients only need pain medication for the first day, though Dr. Vu may also advise you to take Arnica pills to reduce bruising and swelling. These effects tend to max out on the third day after surgery and then recede rapidly. You will return to the practice after one week so that Dr. Vu can remove your sutures. 90% of any swelling you have experienced should be gone by that time, and the remainder should subside within one month, allowing you to enjoy the full benefits of your surgery. Get a more youthful and rested appearance with blepharoplasty. Learn more by scheduling an appointment with our practice in Huntington Beach online or by calling (714) 848-1133.